USAF Band of Mid-America February 12, 2019. 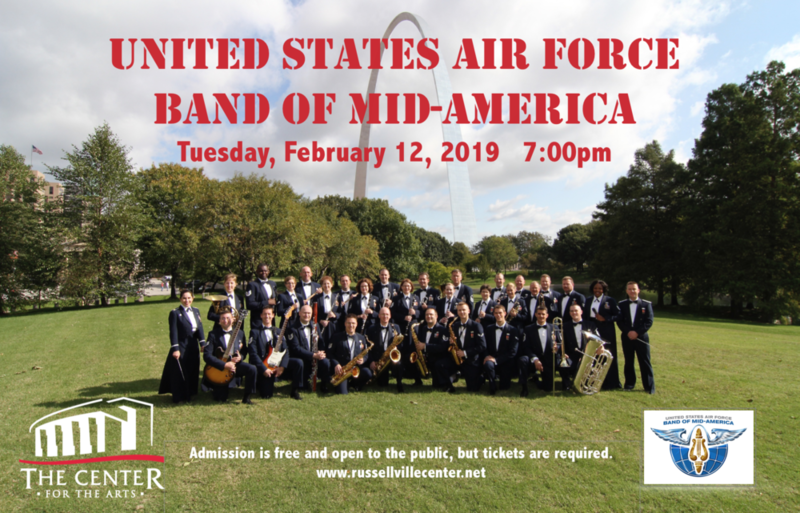 The Center for the Arts is honored to host the USAF Band of Mid-America February 12, 2019 at 7:00 p.m. The United States Air Force Band of Mid-America Concert Band represents the professionalism and excellence found every day throughout the Air Force. This diverse, 45-piece ensemble’s repertoire ranges from symphonic band masterworks, to traditional marches, modern compositions, pops and jazz. During a concert, you are likely to hear stirring works from contemporary composers as well as the familiar sounds of John Philip Sousa or Major Glenn Miller. The band also features talented vocal soloists, performing a wide variety of popular, classical, and patriotic selections. This is a family-friendly, open to all-ages event. Admission is free and open to the public, but tickets are required. Please visit our website www.russellvillecenter.net for tickets. Contact Chrissy Clayton at 479.498.6600 for more information!